Dubai, UAE, January 06, 2019: There are no substitutes for natural ingredients that can give your skin the care that it needs. Only a few have harnessed the powers of these ingredients to give your skin a toxic-free experience. Australia's No. 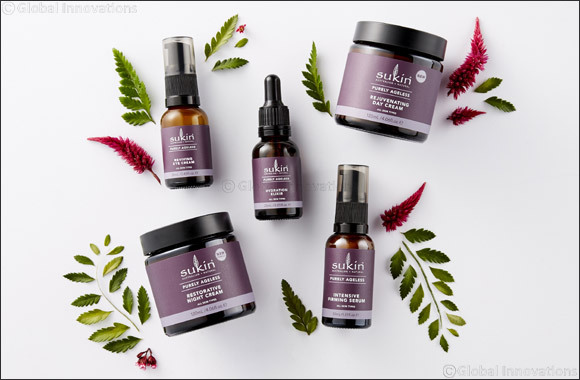 1 natural skincare brand, Sukin, is exceptional in that it offers a range of products for every skincare need, and is both effective and affordable. Sukin's Purely Ageless is one such range that delivers superior results. The Purely Ageless range is the next evolution of skincare, bridging the gap between a product that is natural, environmentally conscious, accessible; and a product that is clinically proven to deliver results. It harnesses powerful naturally active ingredients such as Pure Ribose, Paracress Extract, Crambe Oil, White Hibiscus & Baobab, which help deliver impressive results. Pure Ribose reduces the appearance of wrinkles by up to 78% and smoothes the skin for a visible difference after just 14 days, while Paracress extract reduces the surface of wrinkles by up to 50%. Crambe Oil increases skin hydration rate by 60% over 5 days, and the White Hibiscus & Baobab improves skin firmness and plumpness. This light serum is rich in natural actives and will gently firm, refine and leave skin feeling smooth. Pure Ribose, Acacia Gum and Rosehip Oil work to improve skin elasticity and reduce the signs of ageing after 14 days, with Cocoa Butter to lock in moisture and help protect the skin from environmental conditions. A natural elixir, rich in Crambe Oil, Vitamins A & E and Paracress Extract that will reduce the early signs of ageing, improve the natural elasticity of the skin and deliver immediate hydration to tired skin. Other key ingredients include Jojoba to lock away moisture and Sweet Almond Oil to replenish moisture. The Rejuvenating Day Cream is infused with White Hibiscus and Baobab to naturally plump, firm and hydrate skin, with Pure Ribose working to visibly reduce the appearance of the first signs of ageing, while Cocoa Butter and Goji Berry, rich in Vitamins E & B soften and soothe, leaving skin smoother and more tensile after just 14 days. The reviving eye cream offers hydration and smoothing to the sensitive area around the eyes. Green Coffee works to reduce the appearance of dark circles while Pure Ribose & Sunflower Oil work to fight fine lines and early signs of ageing, with a noticeable difference in 14 days. Sukin is available exclusively at LIFE Pharmacy retail outlets throughout the UAE, in Holland & Barrett Saudi Arabia and soon in Boutiqaat in Kuwait. Sukin is also available in Lebanon at key pharmacies including Summerland Pharmacy, Arax Pharmacy and Express Pharmacy.